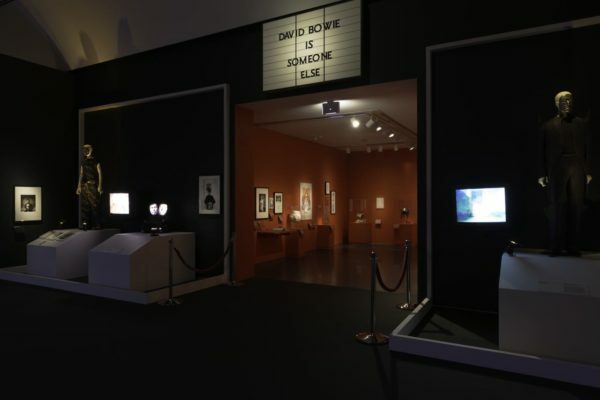 The iconic quote above epitomizes David Bowie Is, the new exhibit currently on show at the Museum of Contemporary Art in Chicago about the English singer who gave birth to glam rock in the early 70s and has become an indispensable fixture of pop culture. The exhibit’s official text bills Bowie as “one of the most pioneering and influential performers,” either a tacit or an unwitting acknowledgment that he was neither a particularly gifted musician or lyricist. But, he WAS an unrivaled image-maker and storyteller who very early on in his career realized that appearance is an indispensable part of being a pop musician. Hence, his frequent metamorphosis and meticulous attention to the finest details of imagery. Though Bowie is prevalently put under the category of rock music, he was a quintessential pop star who, with the spread of television, saw the importance of showmanship and who paved the way for the likes of Madonna later on. Influenced by Andy Warhol and the Velvet Underground, Bowie perfected the art of artifice. “It has to be three-dimensional. I’m not content just writing songs,” he said in 1974. 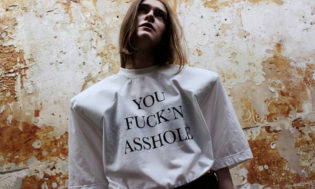 Bowie also had an uncanny knack for capturing the zeitgeist. 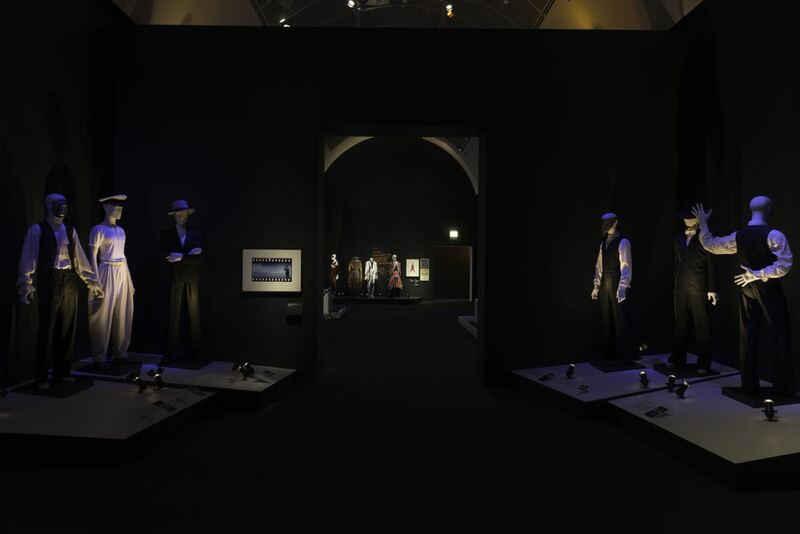 Tall and lithe, young Bowie (real name David Jones) was tailor-made to serve as an icon for trends at the cultural forefront, namely androgyny and homosexuality. Bowie early on embraced excessive makeup and skin-tight, sexualized costumes. For the cover of his 1971 album The Man Who Sold the World, Bowie posed in a woman’s dress. The cover was so controversial that for the US market it was changed to a cowboy carrying a gun. Though straight (or bisexual, as he once told BBC), in 1972 Bowie told the British music magazine Melody Maker that he was gay. Bowie has created several famous personas. First of them was Major Tom, an astronaut, a result of Bowie’s fascination with the revolutionary Stanley Kubrick film, 2001: A Space Odyssey. Displaying his canniness, Bowie released the song shortly before the Apollo touched on the moon. The song became the soundtrack for the Apollo landing, ingrained in the public mind through countless playback of the landing video in every British home with a TV set. Continuing with the space theme, Bowie’s next creation was Ziggy Stardust, a man who fell to earth. He worked closely with the Japanese designer Kansai Yamamoto to create outlandish costumes for the Ziggy Stardust tour. Bowie saw that excessive artifice creates the most powerful images and can be a direct path to fame. In a way, Ziggy Stardust was a celebrity before David Bowie became one, a self-fulfilled prophecy. That is not to say that Bowie was vacuous – quite the opposite. He soaked up the culture around him like a sponge and he was a prodigious reader. He was friends with William S. Burroughs, and was heavily influenced by the experimental plays of Bertolt Brecht and the novels of J.G. Ballard, whose bleak writings dealt with fusion of technology and humanity and were all the rage at the time. For his Diamond Dogs album tour, Bowie created a dystopian city stage set that was based on George Orwell’s book 1984. Dadaists and Surrealists were also a big influence. 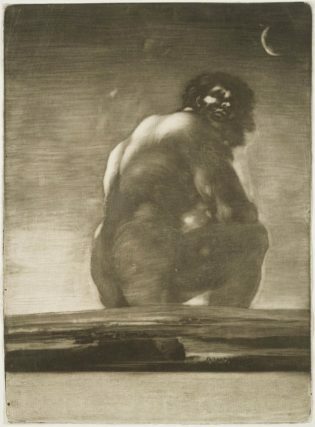 Speaking of surrealists, Ballard once wrote that their importance was capturing, “The iconography of the inner space, concerned with the discovery of images in which internal and external reality meet and fuse.” This is central to Bowie’s work. The exhibit, organized by and originally shown at the Victoria and Albert Museum in London, consists of over 400 objects, from album covers and hand-written lyrics to Bowie’s costumes and rare performance videos. It is also an aural experience, courtesy of the German company Sennheiser that has created a soundtrack that includes Bowie’s interviews, and song recordings. 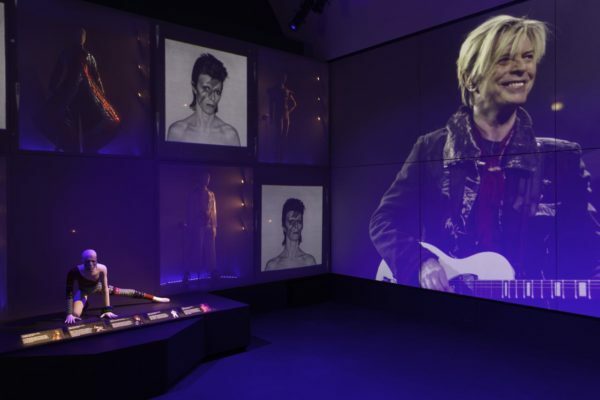 The headset tracks the viewer using a kind of a hyper-localized GPS, so when you stop in front of a screen showing a video of Bowie singing, the perfectly synchronized audio begins to play via the headset. 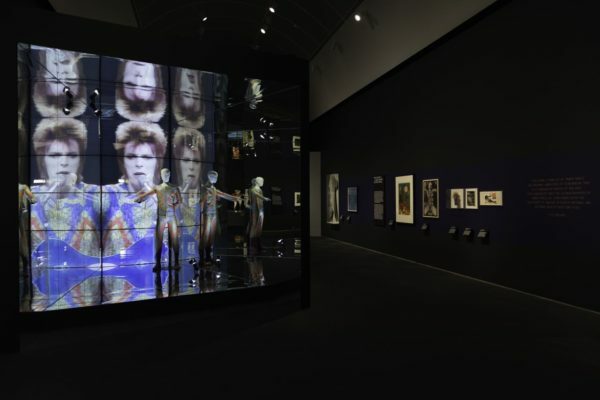 One thing that the exhibit underscores (and is meant to underscore, of course) is just how prolific Bowie’s career has been. He has produced twenty-seven studio albums and over 150 live albums, singles, and videos. He gave over a thousand concerts. And he has also acted in twenty films. Despite his chameleonic career, Bowie maintains in one pre-recorded interview that there is a core to what he does, which he describes simply as style. He has maintained this position in other interviews as well. “I’m just David Bowie, period,” he once told BBC. Nonetheless, Bowie has always moved with the times. When industrial music reached its peak in the 1990s, he toured with Nine Inch Nails and hired Floria Sigismondi, who was working on Marilyn Manson’s videos, to direct his videos as well (Bowie also hired her to direct his two last videos in 2013). 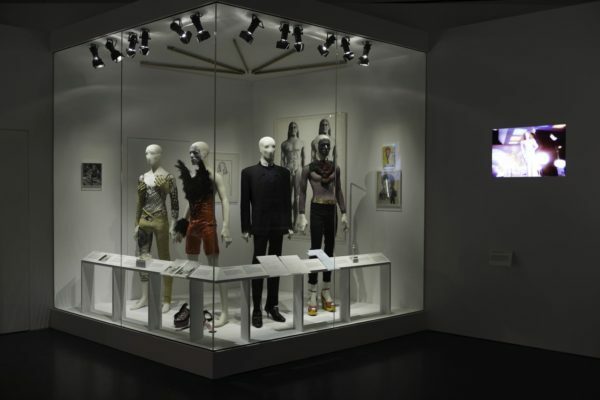 Obviously, where there is image, there is fashion, and Bowie’s relationship with fashion is one of the central themes of the exhibit. 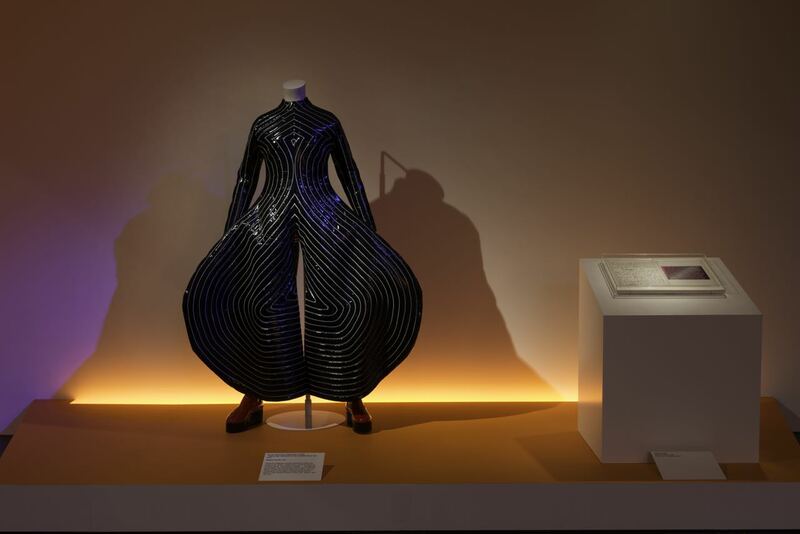 Besides the aforementioned Kansai Yamamoto, Bowie used clothes by Issey Miyake very early on. 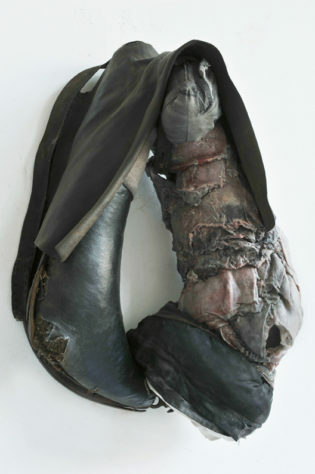 In the 1990s, Bowie turned to Alexander McQueen. The pairing could not be more perfect as both of them clearly possess a runaway imagination. 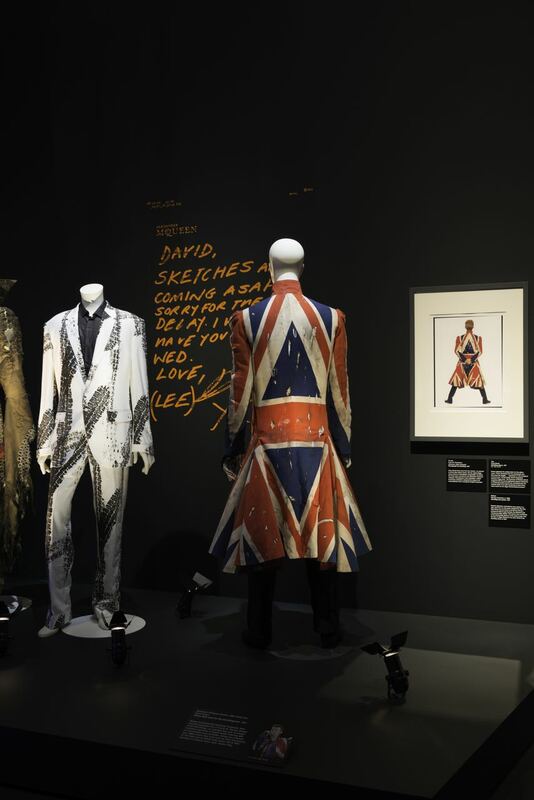 McQueen created several ensembles for Bowie, including the Union Jack frock he wore on the Earthling tour. In 2002, when Dior Homme was all the rage, Hedi Slimane, whose narrow silhouettes were in part inspired by Bowie’s costumes from the 70s, made a frock coat for Bowie’s tour. 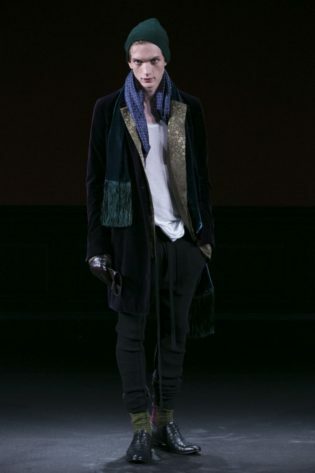 When Slimane received a CFDA award for International Designer the same year, Bowie was the one who presented it. One of the most quietly endearing things in the exhibit is a reproduction of McQueen’s hand-written note on a wall that reads “David, sketches are coming ASAP – sorry for the delay. I will have your package Wed. Love, Lee.” It is also the last thing you see as you leave the exhibit. 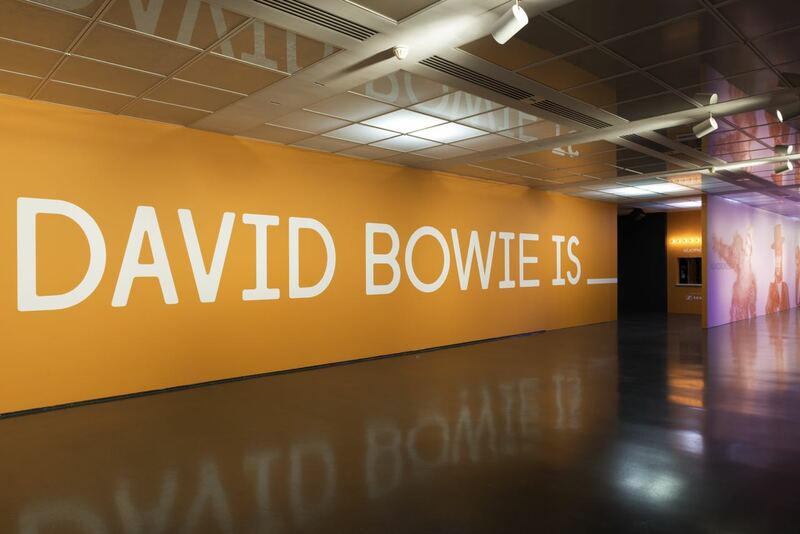 David Bowie Is, MCA Chicago. September 23, 2014 – January 4, 2015. All Photos: Nathan Keay, © MCA Chicago.